IB THEATRE ARTS Dane Fewtrell 11.6 "Theatre is an agent of social change" - (Reference to Brecht and Mother Courage) Brecht's intention when writing Mother Courage was to communicate his beliefs and make people aware of two major issues facing society: war and capitalism. According to Brecht, people deserve the wars they get if they subscribe to a political system which is unfair and favours a specific sector of society, namely capitalism, in which it is up to the individual to secure his own means of survival. In other words, if the system is unjust in any way, war and conflict is inevitable. For this to be understood, it would be essential that the audience sees the play for what it is, as opposed to becoming involved in its story. This means that they would have to be removed (or alienated) from the play, and consistently made aware of it as a play and nothing more. To do this, Brecht jolted audiences out of their expectations and deliberately avoided theatrical techniques that would make appearances realistic. In this way, people were forced to confront the issues at hand and decipher the meanings behind what they were being shown. 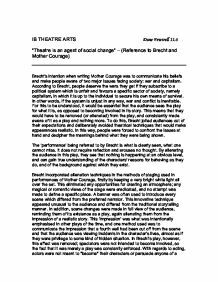 The 'performance' being referred to by Brecht is what is clearly seen, what one cannot miss. ...read more. The appearance of song at unlikely points in the play, when it is least expected is alienating and can confuse an audience. Another alienating characteristic is the fact that the melodic and lyrical singing contrasts with their serious content. In the third scene, for example, the chaplain's song tells of the horrors of Christ's story, and yet the song resembles a nursery rhyme. To differ from the audience's expectations, is the purpose of the play's structure. The passing of time which is unseen between the scenes is often great. After a dramatic event has occurred, the reactions of the characters are expected to be portrayed, or at least acknowledged, but instead the audience is shown occurrences of several years later. Thus, dramatic climaxes do not occur. Each scene is barely connected to the next, to the extent that the audience gets the impression that if a scene were removed, it would make little difference. There is no linked sequence of events, defying the characteristics of a traditional story. I personally think Brecht used the unusual sequence of events to comment on our lives. Most plays use a noted beginning and distinct end, but this is not what reality is. It moves backwards and forwards as we reflect on memories and make decisions about the future before it has even happened. ...read more. The fact that she works hard constantly, but for little gain, would lead us to sympathise with her. Although her deeds in the beginning of scene 3, the selling of ammunition to the opposing army, makes us question her morals. Another example of a contradictory character is the chaplain, who would be expected to condemn war and disapprove of it completely, though he said, "War satisfies all requirements, peaceable ones included, they're catered for, and it would simply fizzle out if they weren't." The chaplain can be said to have been based on contradiction at first he was cold and formal, then later, on the battlefield, he helps the injured and shows a part of himself that is a victim. What Brecht wanted to do to his audience, was a willingness to change people's attitudes, their money-centred mindsets which caused confusion in their basic moral values. According to Marx, whose principles Brecht believed in (although didn't necessarily subscribe to): unless man has food and shelter, he does not have freedom. 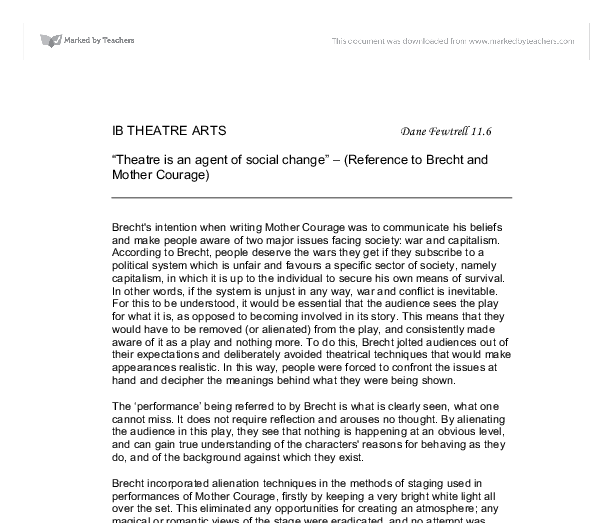 This is what Brecht asserts in 'Mother Courage...' and understanding can only be gained when audiences realise that: "...the obvious is an irrelevance, that this play should be seen not as a tale but as a presenting of issues." By using techniques of character, song, structure, style, and set design, Brecht ensures that the audience remains alienated, and ultimately causes them to consider their lives and make them at the least think. ...read more. as to not give anything away "Jackie and Rosie don't even like cocoa". This could however, through over-use, mean that Margaret actually convinces herself that Rosie is hers, and finds it even harder to let go of her. A very strong point that Bryan Pilkington has is the ability to use his voice to the advantage of the character. He was able to give the Corporal and thunderous booming voice, which dramatically added to his ominous character and without it he probably would have come across quite feeble. In it's heyday, Fox owned and operated a series of ornate, massive, four thousand-seat theatres in major mid /western cities as well the famed Roxy in New York. * Warner Brothers (Jack Warner) o Emphasized "gritty realism" in the look of its films, especially in gangster films. nothing" and seems bitter and jealous while they other attempt to be more positive, without much success of lightening the mood. They discuss how rarely they see Jackie, and ironically, Rosie suggests it's because "she's got no kids". Margaret has spasms of pain, and whilst she blames it on the menopause, it is suggested that it is something more serious. and shocked tone of voice after he realised that one of his pears had been stolen by the Wild Bride. The Prince played upon the dramatic irony of the situation by asking the audience if they had stolen one of the Prince?s pears.